Best ETF valuation opportunities are in individual developed non-US markets where weak economies and investor pessimism have depressed both equity prices and currencies – Japan, Italy and the UK. Emerging market equities are near fair value as a group. The cap-weighted average masks the wide range of attractiveness of individual markets. Collapsing oil prices and choking economic sanctions have devastated Russian equities and the Ruble. After Russia, Brazil, Peru, Chile and Mexico offer the best value while Thailand, Indonesia, China and Turkey offer the worst. 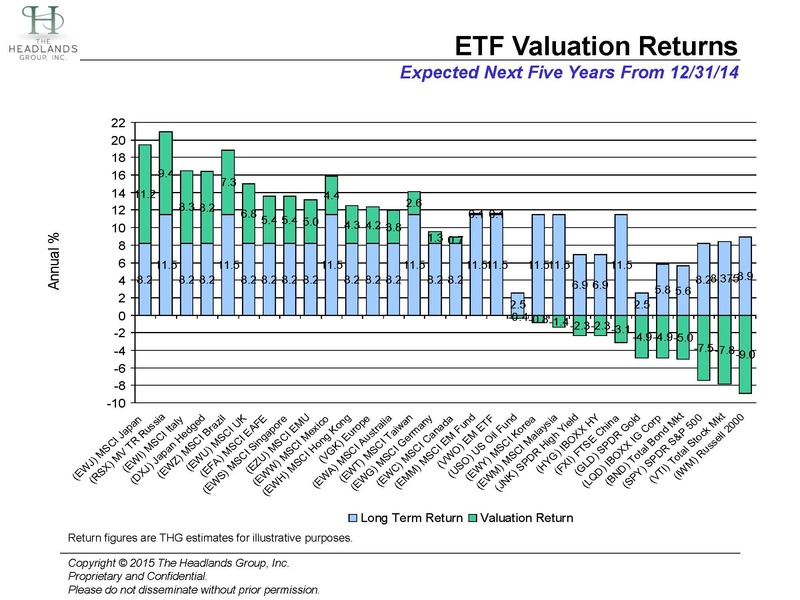 Recent investor favorites US small and large cap stocks provide the least attractive valuation opportunities. Lower gold prices have made the metal less unattractive from a valuation perspective.